iOS 5.1.1 has been released for iPad, iPhone, and iPod touch, the software update comes as build 9B206 and includes a variety of bug fixes including an HDR photo issue, improved AirPlay, iPad network switching, an iTunes store fix, and improvements to Safari reading list syncing. 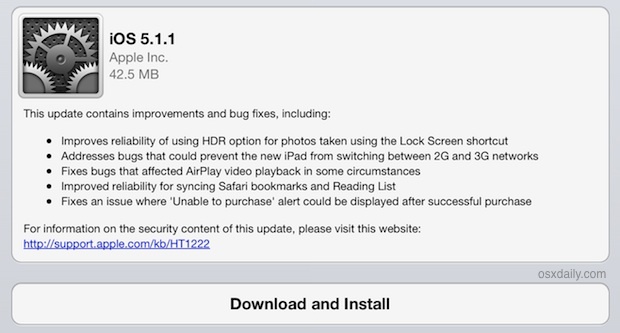 The official changelog is listed below, and the software update is recommended to install for all iOS users. The two simplest methods to update to iOS 5.1.1 are either through iTunes update or on the iOS device itself through OTA updates. Connect the iOS device to iTunes and install the update when prompted, or on the iOS device tap on “Settings” then “General” and then “Software Update”. For the bandwidth conscious, the OTA update on device is the leanest, with the update weighing in around 45MB. These are direct download links to firmware files hosted by Apple, right-click and “Save As” for best results. The file extension should be .ipsw and nothing else, using IPSW files is easy but for most users it’s recommended to download through iTunes or the iOS device. Note the ISPW files are significantly larger than the delta updates available through OTA software update, and are generally best used by advanced users.